A great deal of thanks must go to Melissa Rosier Ireland for her research on the Rosiers and for sharing this information with me and others. Click here with your corrections, comments, or suggestions...always appreciated ! The Rosiers have been in America since the 1600s. Mention of them is made in the Colonies as early as 1602. Originally believed to have come from France, it is now known that the Rosiers immigrated here from Germany and France. The French came to America for hunting and trapping, and were famous for the mountain men who spread out over North America in search of furs and wilderness. The Germans came to farm. Listed in the records of early America was found Reverend John Rozier (b. 1603 in London, graduated from Cambridge) and Elizabeth Hillier marrying on October 12, 1657 in Westmoreland County, Virginia. They had a son John Rozier, who married Mary Williamson on November 11, 1672 in the same County. Another entry shows an Elizabeth Rosier marrying Ignatius Wheeler in Maryland. His death came on October 19, 1776 in that state. Ignatius Wheeler was the son of John Wheeler. 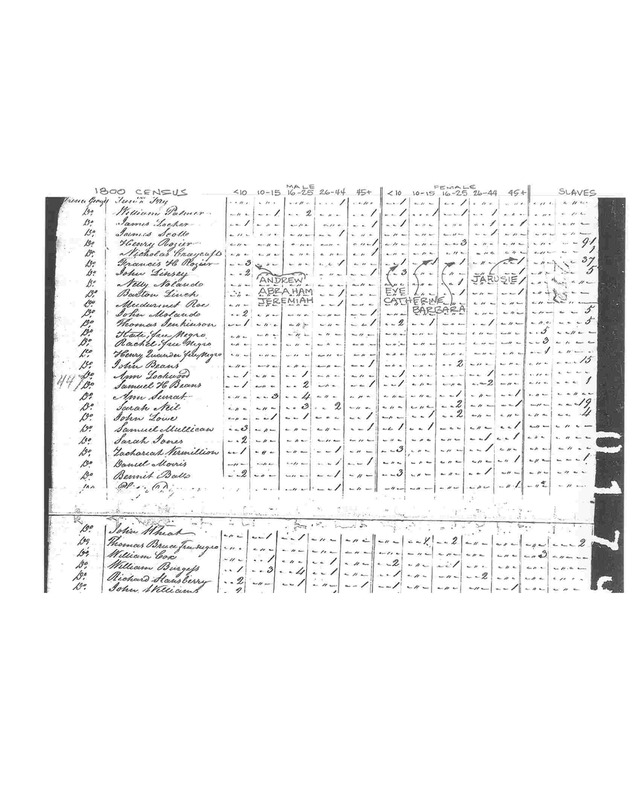 In Prince George County, Maryland in the 1776 census was a listing for Henry Rozer (born 1725) and Eleanor Rozer (born 1728). Their son Henry, Jr., married Sarah Edelan on September 13, 1779 in Prince George County. Arriving in Philadelphia were Adam Roser in 1753, Charles Roser in 1860, Frederich Roser in 1773, George Roser in 1874, Johann Krafft Roser in 1738, Mattheus Roser in 1736, Philip Roser in 1844 and Lawrence Roser in 1732. Arriving in Virginia were Eliza Rosier in 1650 and Morgan Rosier in 1636. Arriving in Maine was James Rosier in 1602 and 1605. He was an explorer born in Norfolk, England around 1575 and graduated from Cambridge. He accompanied Captain Waymouth in 1605 to explore the coast of Maine and Penobscot River. Cape Rosier, Maine is named after him. And on June, 30 1734, Andrew Roser arrived from Germany on the ship, Theodor Korner. He was a farmer. On the same ship, arriving 30 June 1732 was B.F.Roser, another farmer from Germany. The Charles Friedrich Roser family arrived on the Anna Gesina on 12 November 1733. His wife Elise and children, Jacob Philip, John Jacob, Jonathon, Maria E. and Regine Magdeline accompanied him. Charles and his sons listed their occupation as wheelwrights, coming from Germany. Our first known direct ancestors were Francis H. (AKA Lahabin) Rozier and his wife Jarusie first arriving about 1790 in Maryland and settled about 30-40 miles outside of Baltimore. On daughter Barbara's marriage record, her parents are listed as Francis and Jarusie, while on some of the other children's records, they are listed as Lahabin and Jarusie. Lahabin is thought to be a nickname, and Jarusie is probably a derivative of Jerusha. Her maiden name is unknown. Francis was not listed in the 1790 US census, but was in the 1800 . This census listed the location as Prince George's County, Maryland. If they arrived around 1790 as we think, then it was he and his wife and daughters Catherine and Barbara who came over from the German/French border, and the remaining 6 children were born in the US. The only town mentioned during the research was Alsace-Lorraine which is a region in northeastern France, on the French/German border. No confirmation was ever made, however, as to this being the location they were from. In the 1800 US census, Francis was listed with 3 sons under 10 (Andrew, Abraham, and Jeremiah), 1 male age 26-44, himself, 1 daughter under 10 (Barbara), 1 daughter 10-15 (Catherine), 1 daughter 16-25 (Eve) and 1 female 45+ his wife Jarusie. They also had listed 37 slaves. Details of the family are in Appendix 1. Francis moved his family to Harrison County, Virginia (now West Virginia) in 1809, buying 219 acres from Matthew Nutter. His wife Jarusie and daughters Eve D. and Catherine came with him. At that time, the other children were still young (ages 9-14), and we can only assume that they stayed back in Maryland until Francis got settled in a new home. Jarusie was expecting twins (John & Jacob arriving on August 15, 1809), so that may be the reason Eve (then 20?) and Catherine (then 26?) were along. Francis and Jarusie lived in the Sinclair/Colebank area of Preston/Barbour County and are believed to be buried on the mountain at the Ridgway Cemetery near Sinclair, WV where several of their children lie. That is where their son Andrew and his wife Margaret Smith are known to be buried who are our direct ancestors. Andrew and Margaret don't have headstones, but there is reference to them being buried there. Sinclair is pronounced "Sinkler" by the natives. Francis H. Rozier (b. Abt 1770) m. Jarusie Rozier (b. Abt. 1760). The Rosiers lived in the area where Barbour, Taylor, Preston and Tucker counties lie close together, near the Maryland and West Virginia borders, so they were back and forth the county and states lines. 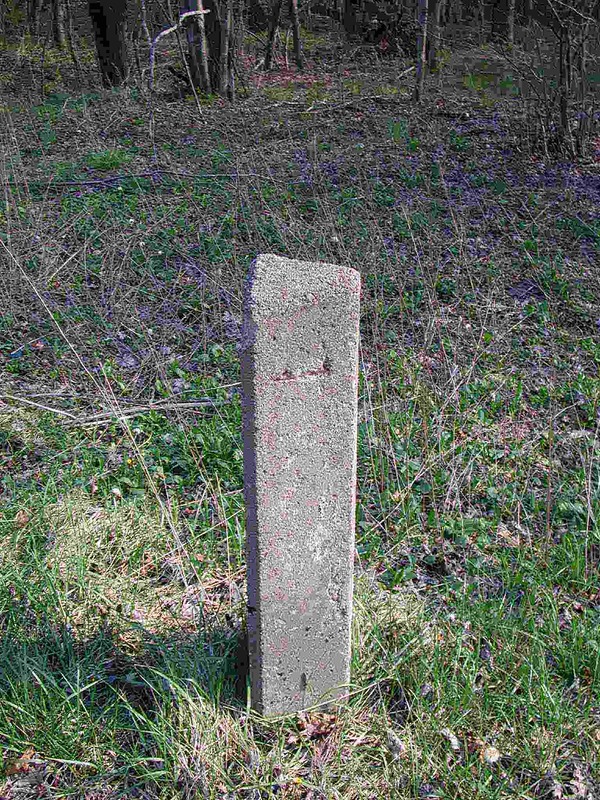 Only 5 miles from the old Rosier farm was the WV-MD line monument #8 which has a very interesting history. Although the WV-MD line was originally established in 1781, there had always been a dispute. In 1910 the dispute was finally settled by a white oak tree, a very interesting story in Appendix 6. The area where Barbour, Taylor, and Tucker counties lie close together is a rugged, mountainous area, and I have heard that the Rosiers who came from rugged, mountainous area of the France/Germany border were interested in hunting and trapping. They weren't too keen on farming until later years. They hunted, trapped, logged, and drank gallons of homemade brew. Many of the early Rosiers are buried on a mountain above Colebank, WV. (Lat.39*14'29"N, Long. 79*50'37"W). The oldest Rosier known to be there is Andrew Rosier born in 1795 and died March 31, 1869 so we know it was used on this early date. The cemetery was officially established on May 27, 1890 by Allen Ridgway and his wife Harriet when they conveyed about 1/2 acre and a right of way. It was named the Ridgway Cemetery. The first trustees in 1890 were W.S. Rosar (Rosier), P.E. Will, and C.C. Rosar (Rosier). One must cross a large field, then hike up the side of a mountain to access it. Bodies were taken up the mountain by horse and sled. There is an old stone foundation thought to have belonged to a church, but was found to be instead a building that stood in the cemetery yard. The bottom portion of the cemetery has many Rosier graves, and it is now maintained due to some enterprising locals. The road has been improved so that you can now drive up the hill to the grave sites. There is a "Gathering/Fund Raising" at the site every year on the third Sunday in August. The cemetery was part of a larger track of land owned by the Millers, and was not being maintained. Because of efforts by these locals, the cemetery portion plus some addition acreage was set aside as a cemetery. 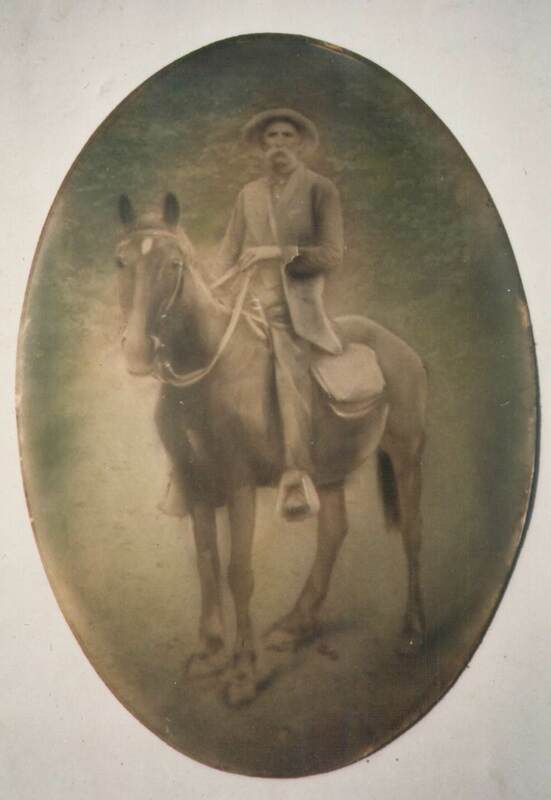 Andrew Rozier (my great great great grandfather) was born in 1795 in Culpeper County, Virginia. He married Margaret Smith on November 8, 1822, and their children, William, Andrew Jr., Absalem and Stephen were born in Tucker County. Their other son, George Washington (my great great grandfather) was born over the border in Maryland as listed in old records. Details of the family are in Appendix 2. George (my great great grandfather) was born in Maryland on January 8, 1823, died September 1, 1900 at Sinclair, Preston County. Service was conducted at No. 8 church by Rev. Woodruff, pastor of the circuit. George's obituary listed the burial place as Ridenour graveyard. This must have later become Ridgway Cemetery since they are known to be buried there. Mahala was born on August 10, 1827, died of Influenza on February 15, 1904 at Sinclair, Preston County. George lived in Sinclair in Preston County and was a farmer. He was born in Maryland and came to Preston County before 1850, as he is listed in the 1850 census . On his tombstone are the words, "HE LIVED AND DIED A CHRISTIAN"
The Goff family is believed to have come from Wales and have been in West Virginia since the1600s. Four Goff brothers arrived in America in 1770 and came to Tucker County with the Minear Group. "The Four Goff Brothers of Western Virginia" is an excellent publication about James, John, Thomas, and Salathiel Goff forging the western Virginia frontier in the 1700s. Mahala was the daughter of Salathiel Goff and Malinda Garner, a daughter of Lewis Phillip Burgess Garner and Mary Elizabeth Rickmeyer and granddaughter of James Garner. Mahala was born in Virginia and died of Influenza in 1904. Her will was drawn up on March 17, 1901 in Preston County and was probated in 1905. Her father Salathiel was born in 1783 in Virginia and worked as a farmer and a miller. Her mother Malinda was born in 1804, twenty-one years after her father. Mahala had seven brothers, James S. (b.1820-21), John (b.1825), Martin Van Buren (b.1836), Henry (b.1838), Preston (b.1841), George (b.1843) and Samuel (b.1845) and three? sisters Phoebe Ann (b.1823),Lucinda?, and Rachel J.(b.1833). The Goffs lived in Preston County. George and Mahala had 9 children, James H. , John W. , Christopher Columbus , Stephen B. , William Morgan , Jacob Peter , George Washington (my great grandfather), Charles Winfield and Mary Caroline. Details are in Appendix 3. One year after George (senior) died, part interest to the farm where George and Mahala lived was sold to Mary C. Wilson for the sum of One Hundred Dollars. Mahala was still living on the farm . George (senior) and Mahala must have deeded the land to George and Rebecca, since they were the ones that signed the deed. This Deed, made this 19th day of September, A.D. 1901, by and between G.W. Rosier and Rebecca A. Rosier, his wife, of Union District, Preston County, West Virginia, the Grantors and Mary C. Wilson, of Reno District, County and State aforesaid, the Grantee. Witnesseth, that for and in consideration of the sum of One Hundred Dollars, in hand paid, the receipt whereof is hereby acknowledged, the said Grantors do grant, bargain, sell and convey, to the said Grantee all of their undivided interest in and to the tract of land in Reno District, County and State aforesaid upon which Mrs. Mahala Rosier, widow of George Rosier, deceased, now resides, said land adjoining lands of Wilson Bolyard, Philip Runner, Margaret Rosier and Charles Nestor but savings and excepting from this conveyance all of the Grantors interest in and to the oil, coal, mineral &c. under said land and reserving, to the Grantors, their heirs and assigns a right of way and right to remove said oil, coal minerals &c.&c. Witness the following signatures and seals. George (my great grandfather) was born on December 16, 1861, died March 14, 1931. George and Rebecca are both buried at East Oak Grove Cemetery in Morgantown, West Virginia as are all 8 of their children. George was a farmer in Barbour and Preston Counties, lived near Amboy, before moving to Monongalia County in 1928. Rebecca was born in Preston County, a daughter of Henry P. and Mary Sanders Carrico. George and Rebecca had 8 children in the following order: Melvin Elmer, Henry Alva, Harry Gordon (my grandfather), LeeRoy, Rosa Ellen, Herbert Neil, Willie Ross, and Ira Ison. More detail is under George Washington and Rebecca Carrico in Appendix 4. The old Rosier farm is located near Amboy, WV (Lat. 39* 20' 13", Long. 78* 36' 26") just off route CR80. I was told there was a Stirling Engine at the farm. These are usually two cylinder engines in which one side is heated (they would have burned wood) and one side cooled (they probably ran water over it) and the different temperature would turn a shaft. A flywheel was normally attached to make it run smoothly. 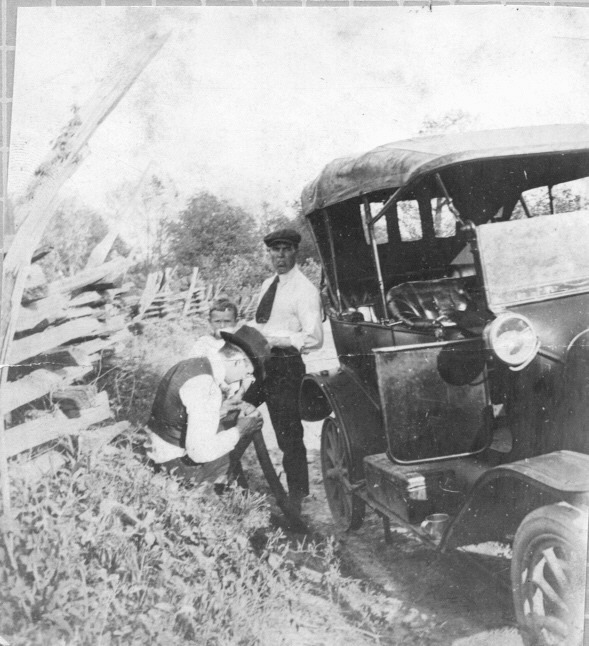 My grandfather, Harry Gordon Rosier lived at 217 Green Street in Morgantown and he and my father Harry Lester Rosier use to take their model "T" and visit George & Rebecca at the farm (see picture below). There was a steep hill to the farm, and my grandfather would blow into the gas tank to keep the flow of gas, otherwise the old "Lizzy" would stall. Sometimes they would back up the hill for the same reason. Harry Lester wrote "I remember my dad working on the 1914 Ford touring car. Of course, most of the work was on the road fixing flat tires. In those days, there was no such thing as a spare wheel, so the car was jacked up, and the tire removed from the rim of the wheel using provided tire irons. These were stored in a tool box mounted to the running board. The tube was patched and the tire put back on the wheel and pumped up with a hand pump. With two good men, the task could be done in about 45 minutes, if all went well. And flat tires were very common. In fact a trip of longer than 50 miles was sure to produce one (It was 41 miles from Morgantown to Amboy where the George & Rebecca Rosier farm was located). And with the speeds of those days, an outing or visit to relatives always included a packed lunch and an early start. That 1914 Ford was a sturdy car, and I guess would run with more things wrong with it than any other automobile. The running lights (HA!) were lit by gas from a cylinder mounted on the left running board. About the only thing the lights did was to warn a pedestrian. It had two gear speeds, Low and High. With the emergency brake pulled up, the car was in neutral, or with the brake off, neutral could be had by pressing the left pedal down half way. All the way down was in Low, and released was High. The middle pedal was reverse and the right pedal was the foot brake. The gas and spark advance was on the steering column, and that was the extent of the control. It had a four cylinder engine of unknown horsepower (Ford Specs. = 20HP @ 1600rpm). But, it had a large displacement of a four inch stroke with four inch diameter cylinders. The thing would run, and on level ground it would do zero to 50 in five minutes. It was an open air touring car, with a split horizontal windshield, the top half which could be cranked out for circulation of a little air. And, if it rained, it was necessary to put up the side curtains, carried under the rear seat. But, most folks didn't bother since they obscured sight and did little to keep the rain from the inside of the car. The windshield wipers were manual, of course, and the driver could reach up and swish them at will. Incidentally, the top could be let down to make a two seated convertible, but much letting up and down wore out the fabric and cracked the isinglass windows. So most folks just left them as they came from the factory. As I remember, the car cost about $300, which was a considerable sum in the early 1900s." Harry Gordon Rosier (my grandfather) was born on March 19, 1890. He married Nina Hazel Church on June 20, 1915. Harry worked as a machinist and a welder and Nina was a teacher. Harry was welding a door at the building on the grounds of East Oak Grove Cemetery in Morgantown. My father told me that he wrote his name on a piece of paper and dropped it into the hollow part of the door; then made the final closing weld. The door is still there today and so must be that piece of paper! Harry also machined a Canon mainly fired on the 4th of July. They used gun powder and wads of paper to load. One July 4th after lighting the fuse on the front porch of their house at 217 Green Street, the canon swiveled around. Even today you can see the patched hole in the porch ceiling where the canon took its toll. We looked and finally located a canon in the basement of the Green Street house, but my Dad (Harry Lester Rosier) said that he didn't think it was the original, but one he made himself at a later date. Nina was born in Taylor County on December 13, 1889, a daughter of William Oliphant (b.1863, d.1950) and Mattie Barnes Church (b.1868, d.1926). She was a born teacher. Originally she taught with a special teaching document which was probably based solely on taking an exam. When the State required a high school diploma, she went back to school, got her diploma and then right back to teaching. Some years later the State required a college degree. Again, she went back to school, this time to the University of West Virginia. 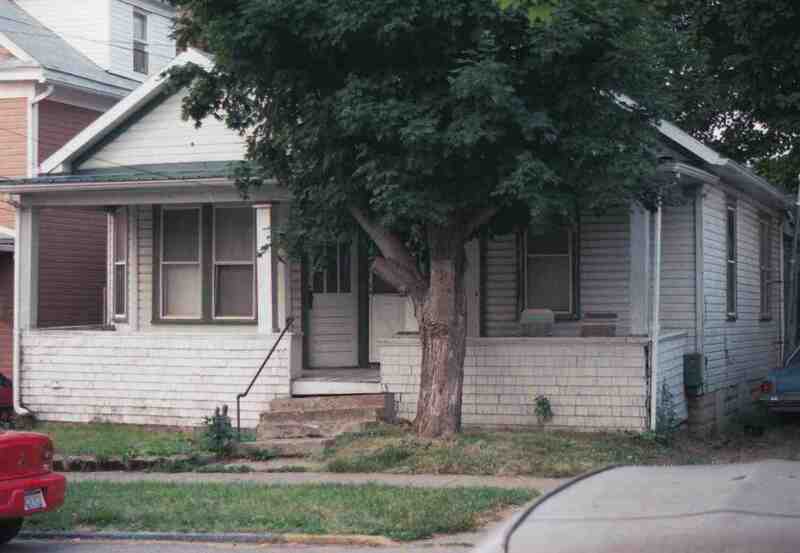 Most of the time, she had to walk to and from the University which was several miles from the house at 217 Green Street. After graduating with a BA degree, she went right back to teaching. Harry moved from Amboy to Morgantown at the age of 11?, and worked for the Jackson Grow Machine Shop. Nina graduated from West Virginia University and Fairmont College and taught in Monongalia County schools. Harry died young on October 13, 1934 from a heart condition. Nina died on September 10, 1979, and both are buried at the East Oak Grove Cemetery in Morgantown, WV. where Harry placed that piece of paper. Harry and Nina had four children, Harry Lester, Nina Margaret, Mattie Rebecca, and George William. George William died at the age of 4 months. More family details are in Appendix 4. 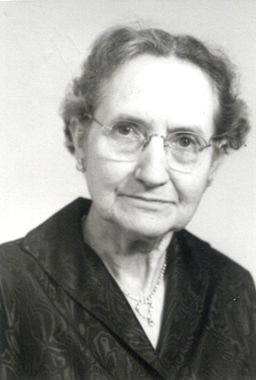 Nina was born in Taylor County on December 13, 1889 and died September 10, 1979 in Morgantown. An interesting side note is that Nina was at the Andrews Methodist Church in Grafton, West Virginia on May 10, 1908 which became the very first observance of Mother's Day in the US. They were honoring Anna Reeves Jarvis and West Virginia Governor Glasscock declared it to be an observance of Mother's Day. My great grandfather helped build the Andrews Methodist Church. If you would like more detail, see Appendix 7. Harry Lester Rosier (my father) was born in Morgantown, West Virginia on April 28, 1916 (d.2/28/2005) and married Elma Edith Dalton on September 7, 1935 at Oakland, Maryland. Elma was born on March, 29, 1915 (d.8/31/2004), a daughter of Thornton Dalton (aka Tinker) and Alice Nicholson. Harry and Elma lived in Greensboro, North Carolina and had Gordon Lester, Robert Edwin, David Ralph, and Douglas Byron. Harry graduated from West Virginia University in 1938 with a degree in Electrical Engineering. He worked for the Telephone Company in Morgantown and later in Charleston. He then transferred to Bell Telephone Laboratories, and worked in Boston, New York, Whippany, New Jersey, and then Greensboro, North Carolina. Harry died in Roanoke, VA on February 28, 2005 and is at the Guilford Memorial Park Mausoleum in Greensboro, NC. Robert Edwin Rosier (me) was born on August 26, 1938 in Morgantown, West Virginia. I married Susan Paxson Gillespie on June 11, 1960 in the Quaker tradition at the Camden Friends Meeting House in Camden, Delaware. In 1962 I graduated from Guilford College in Greensboro, NC with a BS degree. Susan was born on October 2, 1939 in West Chester, Pennsylvania. She received a BA Degree from Guilford College in 1963. She was Spanish major. After both graduating from Guilford College, we entered the Peace Corp training in 1963 in Albuquerque, NM. We returned to Greensboro, NC and I took a position of Electrical Engineer with Bell Telephone Laboratories designing telephone equipment. In 1977 I transferred to Southwestern Bell in San Antonio, Texas. Hobbies include Amateur Radio (call sign "K4OCE"), Astronomy, having home built a 17.5" diameter Dobsonian type telescope, collecting antique radios and phonograph, and robotics. I own several Robots. 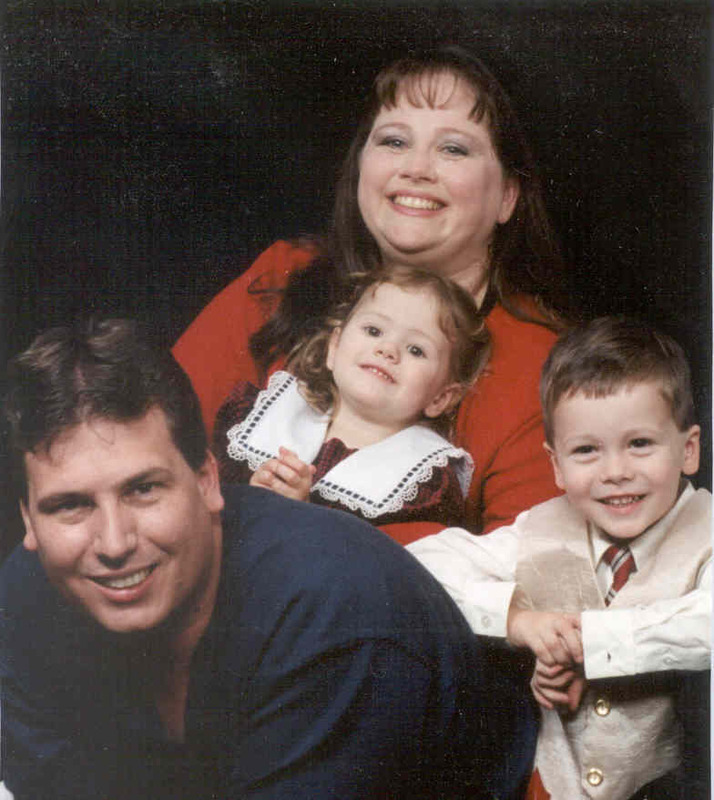 Our children are Mark Edwin, Thomas Edwin, and Cheryl Renee Rosier. Victoria Renee Rosier was born on November 29, 1984 at University Hospital in San Antonio, Texas. She married Matthew Franklin (direct descendent of Benjamin Franklin) on December 21, 2002. In December 2005 Vicki graduated from the University of Texas at San Antonio with a degree in Accounting. Matt was born on March 15, 1982 in Colorado. Matt graduated with a Bachelor of Science degree in Biology in December of 2002 from the University of Texas at San Antonio. He plans to continue his education in hopes of a position in research. He received his Masters Degree in 2010. They have a son Daniel Benjamin Franklin born December 4, 2009 and a son Luke Franklin born . Thomas Edwin Rosier was born on April 11, 1968 in Greensboro, North Carolina. He arrived early and was born at home. After the family moved to Texas in 1977, Thomas attended Texas A&M and worked at his brother's computer store for a while and then worked for the Northside School District managing and designing computer networking systems. He then took a position with Southwestern Bell doing similar work. On March 5, 1994 he married Rebecca Talley (Becky) and they had two children, Brandon Thomas (b. 5/4/1999) and Brianna Caitlyn (b.7/19/2001). Rebecca was born in Georgia on September 1, 1964. She worked at KENS-TV while going to college. After college she worked for the City of Austin in the Auditing Department until Brandon was born. She is now a housewife and a part time CPA. Cheryl Renee Rosier was born on June 7,1970 in Greensboro, North Carolina. The family moved to Texas in 1977. She attended the University of Texas and St. Mary's University where she earned a PhD in Psychology in 1999. 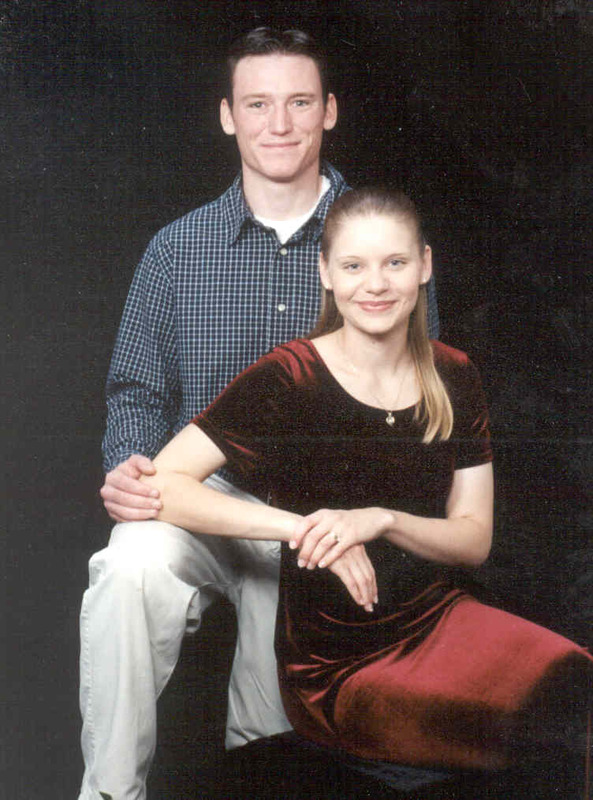 She married Craig Davis on December 30, 1999. Craig was born on February 18, 1974 in Dallas, Texas. He graduated from the University of Texas with a Law degree and soon passed the bar. They have one son Hunter Allen Davis born September 28, 2006. Eve D. (b. abt. 1783) married George Sigley, a German immigrant, and had 7 children: Francis (b.5/5/1810,d.1880), John (b. 4/1/1815,d.1880), David (b.5/29/1817,d. 8/1/1889), Elizabeth (b.5/29/1917,d.1820) Nancy (b.1808) and Catherine (b.1796,d.1887), and George Sigley (b.9/12/1874,d.11/27/1894). They lived in Preston County. Catherine (b. abt. 1789) married George Elias Shahan on May 16, 1818. Shahan is a common name in Preston and Barbour Counties, a well known and large family. George was the son of John and Sarah Wells Shahan and was born in 1795 in Delaware. They had 10 children: John, Ann (b. 1826), David, Catherine (b.1/17/1828), George Washington, Elizabeth, Lavina Jane, Sarah Jane, Christina and a male infant, no name. 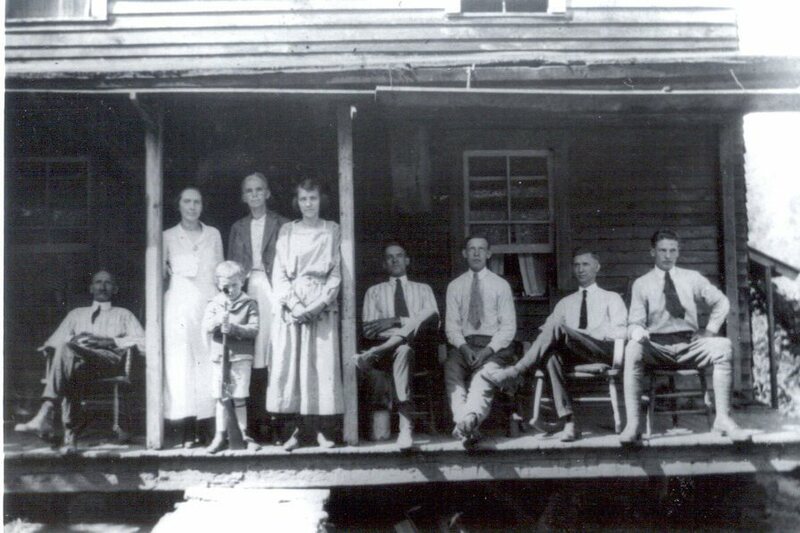 They were the progenitors of a large and prosperous family, who owned numerous tracts of land in Preston County. The Shahans came from Ireland around the time the Rosiers arrived from France. Catherine died in 1887, and George in 1843. Andrew Rosier (b. abt. 1795) and Margaret Smith married in 1822, and had five children. William, Andrew Jr., Absalam and Stephen were born in Tucker County. George Washington (my great great grandfather) was born over the border in Maryland, as listed on old records. Andrew was also born in Maryland. Abraham (b. abt. 1796) came with the family from Maryland. He moved to the Cherry Camp section of Harrison County about 1860, and had 11 children. They are Eli, Mary, John Wesley (whose one son went on to become President of Fairmont State College, and the other son became a doctor, who married into Senator Jennings Randolph’s family), William, George, Sarah, Emily, Malissa, Anna (might be Ann A. ), Harriet and a infant male, no name. 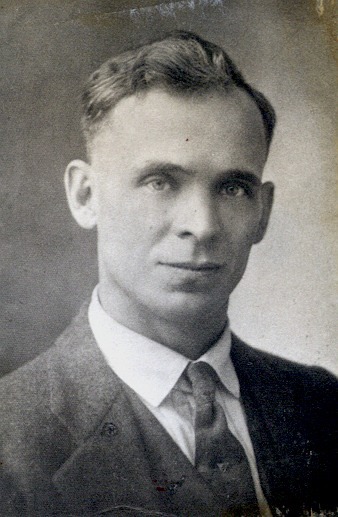 At the Fairmont State College, Rosier Field was named after John Wesley Rosier Jr.
Jeremiah (b. abt. 1797) married Rebecca Phillips it is believed. 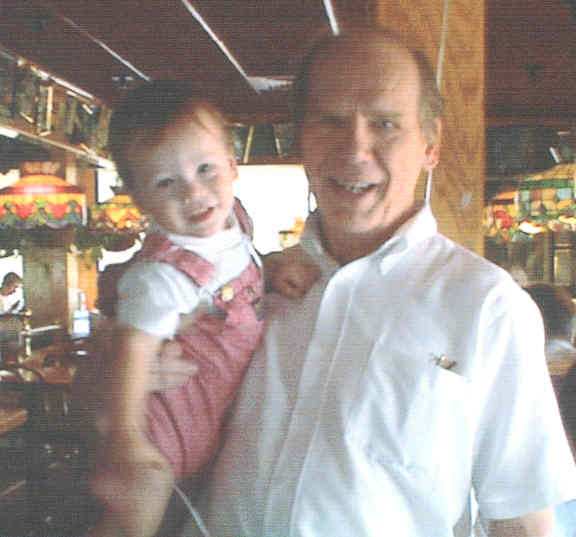 Little is known of him other than he lived in the Clover Run area of Tucker County. This location is just over the mountain from Sinclair where his parents had lived. No children have been found. Barbara was born on July 2, 1800. On March 6, 1820 she married Stephen Bolyard, of the large Bolyard clan, and lived near Marquess in Preston County, where they are buried. Their 11 children were Henry Preston (b.1822), Francis (b.1823), Jacob R. (b.8/28/1827,d.4/22/1906), Sarah (b.1829), Frederick (b.1834), Allen (b.1837), Stephen (b.1839,d.1879), Nicholas (Stephen’s twin)(b.1839) and Jemima (b.4/4/1841,d. 1928). (I found reference to Elizabeth Brooks, Joshua, Barbara & Mary Ann as children too). Stephen had one son and one grandson who fought in the Civil war on the Union side. Stephens’s parents were Stephen (b.1760,d.1840) and Barbara Margaret Neifer Bolyard. Jacob (a twin) (b. 8/15/1809, d. 6/1890) married Sarah ?__ and also Mary Thomas, and lived and farmed near Knottsville in Taylor County where they are buried. Jacob and Sarah had John, Herman, Lucy and Mary. Jacob and Mary Thomas had a set of twins (which run in the Rosier family down through the ages), Maria Ann, Thomas, Luzianna, Henry, John W., Nancy and Martha Rosier. John R (Jacob's twin) (b. 8/15/1890, d. 11/21/1885) married Narcissus Hull, also lived and farmed in the Knottsvile area, where they too are buried. Their 11 children were Harriet, Jacob, Sarah Ann, Rosanna, Caroline, John, Edgar, Lemuel, Amanda, Sanford, and Catherine Rosier. The Rosiers lived in the area where Barbour, Taylor, Preston and Tucker counties lie close together, near the Maryland and West Virginia borders, so they were back and forth the county and state lines. It is a rugged, mountainous area, and not too surprising that many of the Rosiers came from the rugged, mountainous area of the France/German border. Besides farming, one source said they hunted, trapped, logged, and drank gallons of homemade brew. Andrew was born in Culpeper County, Virginia in 1795. He was an early settler in the Reno District of Preston County. On November 8, 1822 he married Margaret Smith who was born in 1806 in Maryland. Andrew was a farmer. Their children were George Washington, Steven, William, Andrew, Jr., and Absalam. All their children, except George, were born in Tucker County. George was born in Maryland and he was the oldest. Andrew died on March 31, 1869. Andrew & Margaret are both buried at the Ridgway Cemetery near Sinclair, WV. (Look for Margaret's death date). George Washington (my great great grandfather) was born on January 8, 1823 and died September 1, 1900. He married Mahala Goff of a Welch family of Goffs that were another pioneer family in the area. She was born on August 10, 1827 and died February 15, 1904. They had 9 children. James H.(b.7/24/1848, d.5/30/1867 ), John W. (b.7/17/ 1850), Christopher Columbus (b.7/17/1852,d.8/26/1921), Stephen B. (b.10/24/1854, d.12/15/1894 ), William Morgen (b.5/21/1857,d.9/12/1921), Jacob Peter (b.9/1859, d.4/ 9/1905), George Washington (my great grandfather, b.12/12/1861,d.3/14/1931), Charles Winfield (b.5/ 8/1864,d.8/12/1927), and Mary Caroline Rosier (b.5/ 5/ 1866,d.12/18/1947), and a set of twins presumably died young. Charles Winfield was a merchant, lawyer and undertaker in the Danville area, located down the road from Sinclair. Charles and his wife Annie are buried at the Ridgway Cemetery. Steven was born on July 22, 1826. He married Martha Skidmore. Martha was born in 1832. They had 6 children; James, William, Mary E., Amanda, Felix, and Sarah. Steven died on November 19, 1898 of Influenza and is buried at the Ridgway Cemetery. William was born in 1837 and married Martha Davis. She was also born in 1837 and they lived in the Clover Run area of Tucker County. William served in the Confederacy. Their children were Nelson M. (b.1857), Andrew (m. Katherine Crosten), Albert, Dianna and William. Andrew Jr. was born in 1842 and married (?) and lived in the Clovers Run area of Tucker County. Their children were Deskin Elmer, Claudius (b. 1/ 28/1884), Odious "Ode" (b.5/4/1886), Lillian J. (b.5/10/1893) and Merly (b.11/1895). Andrew is thought to be buried in the Harsh cemetery on Clover Run, where Deskin is buried. Absalam was born on May 12 1850 in Tucker County. He married Colwistimiry Christina Smith on December 21, 1873. They lived near St. George in Tucker County and had 8 children: Lafayette, Jennie, Thomas, George Washington, Mary, Henry Clay, Joshua, and Albert Rosier. Ansalam was religious and helped establish the Union Chapel Church on Clover Run. George and Mahala had 9 children and a set of twins who died as infants; James H. (b.7/ 24/1848, d.5/30/1867), John W. (b.7/17/1850,d. ? ),( not in 1860 census), Christopher Columbus (b.7/17/1852,d.8/ 8/1921), Stephen B. (b.10/ 24/1854,d.12/15/1894), William Morgan (b.5/21/1857,d.9/ 12/1921), Jacob Peter (b.9/1859,d.4/ 9/1905), George Washington (my great grandfather)(b.12/12/1861,d.3/14/1931), Charles Winfield (b.5/8/1864,d. 8/ 12/1927) and Mary Caroline (b.5/5/1866,d.12/18/1947). James H. Rosier was born on July 24, 1848 in Preston County, Virginia (later became West Virginia). He died on May 30, 1867 and on his tombstone at Ridgway Cemetery are the words: "BLESSED ARE THE YOUNG AT HEART, FOR THEY WILL SEE GOD". John W. Rosier was born July 17, 1850 and presumably died young. (not in parent's household in 1860). Christopher Columbus Rosier was born July 17, 1852. He was a farmer. He married Margaret M. Bolyard on November 28,1875 in Preston County. She was born in Preston County in February, 1856 and the daughter of William and Sarah Jane (Shahan) Bolyard. They are enumerated in the 1880 and 1900 censuses of Preston County. Their children are Lulu (b.7/27/1877,d.11/27/1924), Willie T. (b.2/3/1881,d.10/22/1938), Charles W. (b.4/1884), Sarah Ada (b.9/30/1885,d.7/24/1927) and Tacie J. (b. 3/27/1889,d.4/17/1923). Lulu married John Arthur Kerns, a widower, on April 12, 1917 in Garrett County, MD. (she might have been married before). John was born in Taylor County on December 25, 1885, and died in Preston County on December 6, 1961. 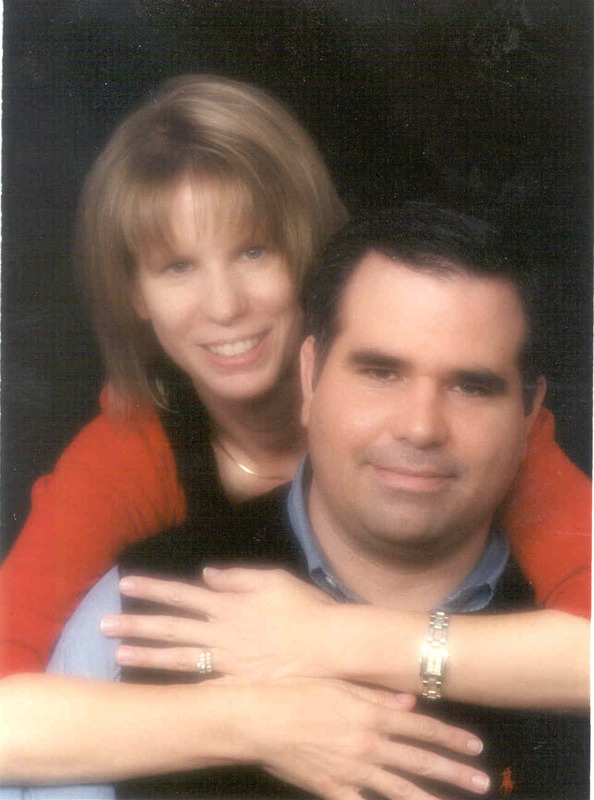 He was the son of Joseph and Becky Jane (Severe) Kerns. They lived in Rowlesburg, Preston County. Christopher died of Asterios-Clerosis in Preston County on August 26, 1921. Stephen B. Rosier was born October 24, 1854. 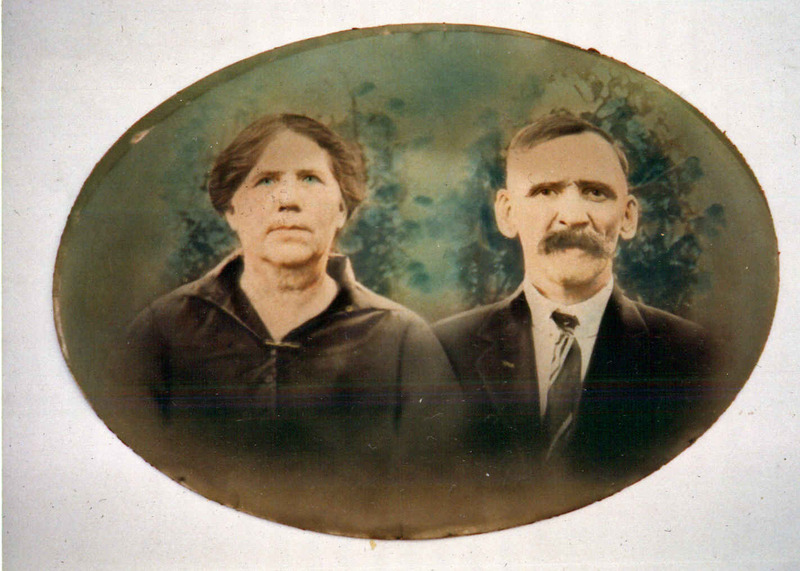 On November 15, 1878 he married Frances America Spring, born in Harrison County February 22, 1855 and died in Barbour County September 22, 1923. She was the daughter of Samuel & Amelia A. Stream Spring. They were married in Preston County, and their children were Sherman Marshall (1880-1900) and George Thermen (b.1893)(AKA Fred B. Rosier). He died of TB at age 40 on December 15, 1894. Stephen and his son Sherman are at the Ridgway Cemetery, but names are Rosar on the tombstones. Frances is buried in the Mount Pleasant United Methodist Church Cemetery, near Thornton, Taylor County. Twins, female and male born 1856 and both died from fever in February 1857. William Morgan Rosier was born on May 21, 1857 in Preston County. He was married in Taylor County on April 14, 1887 to Iris Columbia Channel. She was born in Preston County on March 8, 1865, daughter of Westley and Arah Etta McDaniel Channel. They are enumerated in the 1900 census of Preston County. He died at Kasson of typhoid fever on September 21, 1921. She died in Preston County on March 30, 1945. Both are buried at Ridgway Cemetery. Their children: Ernest W., Cora Mae, Effie Grace, Leota Pearl, Ida Belle, Ellis, Maude Lena, and Bernice Edna Rosier. Jacob Peter Rosier (Rev.) was born in Preston County in September, 1859. 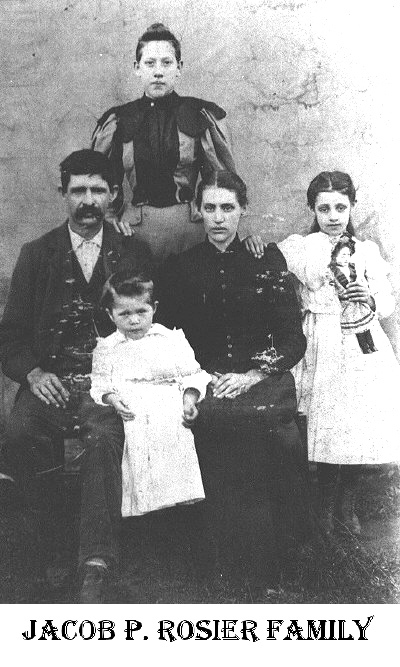 He married Allie Almira Keiser on January 3, 1889 in Preston County and they had three children; Jennie Lynn (b. 10/8/1889,d.7/6/1962), Hoy B. (twin)(b.11/9/1893 d.10/17/1918), and Roy (twin)(b.11/9/1893). Hoy married Irene Weimer and had an infant b.& d. in Preston County on March 7, 1920, stillborn. Roy died at age 2 mo, 3 days on January 12, 1894. Jacob died on April 9, 1905 and Allie died August 10, 1956. She was born on July 17, 1866, daughter of Simeon and Margaret E. Cizgans Keiser. They are enumerated in the 1900 census of Preston County. Both are buried at Shiloh Church of the Brethren Cemetery near Kasson, Barbour County. George Washington Rosier (my great grandfather) was born on December 12, 1861. He married Rebecca Ann Carrico on May 3, 1885. Rebecca was born in June 2,1862. 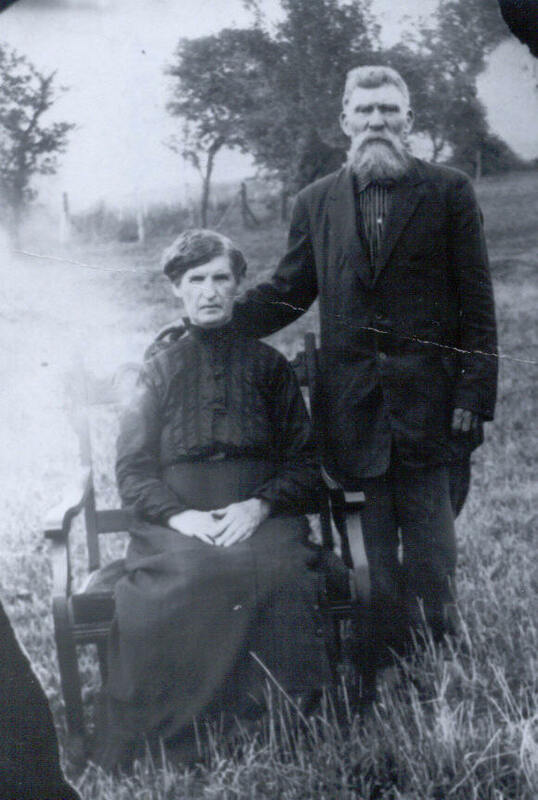 Both were born and married in Preston County and they are enumerated in the Preston County 1900 census. They lived near Amboy, and moved to Morgantown in 1938. George died on March 14, 1931 and Rebecca died on February 19, 1932 both in MN County. Both are buried at the East Oak Grove cemetery in Morgantown. Their children; Melvin Elmer (b.2/19/1886,d.10/13/1962), Henry Alva "John", Harry Gordon, LeeRoy, Rosa Ellen, Herbert Neil, Willie Ross and Ira Ison. Charles Winfield Rosier was born May 8, 1864 in Preston County. He owed a store and was a merchant at Dent near Colebank. He worked as the local undertaker and doled out legal advice to the community. 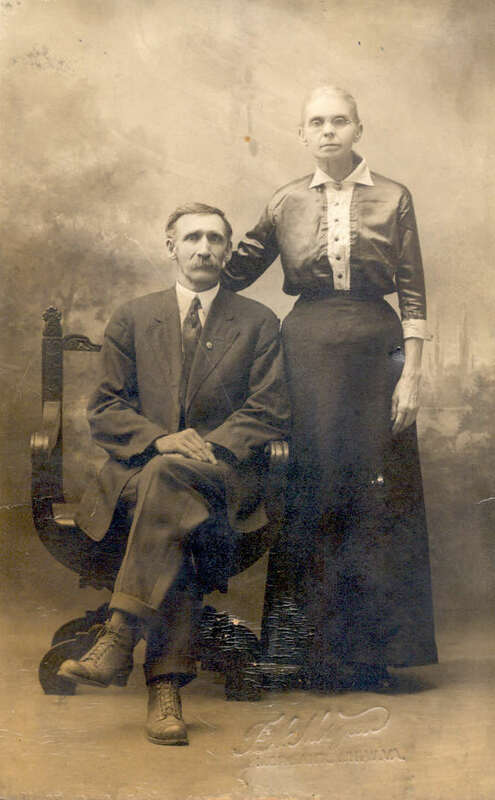 On October 26, 1886 in Taylor County, he married Anna Bell "Annie" Spring. She was born in Taylor County on April 15, 1860, and was the daughter of Joseph and Mary Stream Spring. They are enumerated in the 1900 census of Preston County. Charles died August 12, 1927 and Annie died November 6, 1949, age 89. They are both buried at Ridgway Cemetery. Their children: Earl Bradford , Floyd Arthur, Arnie Lee "Dutch", Bessie May, Chloa Delphia, Minnie Leota and Charlie Bryan Rosier. Mary Caroline Rosier was born on May 5, 1866. She married James William Wilson, son of George W. Wilson, on March 19, 1896 in Preston County. James was born on February 19, 1846. James was first married to Laura Poling on August 10, 1876. They had two children, Lona Wilson and Dr. Franklin Wilson. Lona (b.2/1897) married Clarence Rosier (b.9/17/1881, d.2/16/1936)(only Rosier-Rosier Marriage I have found) on April 13, 1919. Clarence was the son of William S. and Tena Shahan Rosier. Lona and Clarence lived at Kasson and had Clarence, Jr. (b.3/4/1921, d.4/2/1921),Frieda (who married Joseph Spring and lived in Grafton), Theda and Archie who lived in Baltimore. 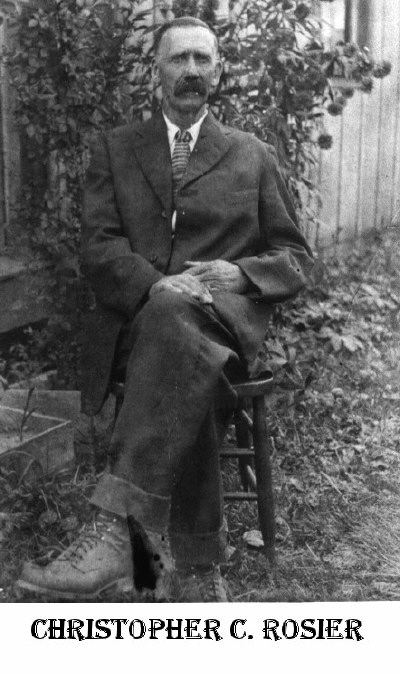 Doctor Franklin Wilson was born on June 5, 1902 in Preston County and married Virginia Eliza Alford on March 30, 1923. Virginia was born on September 23, 1899, daughter of Harvey and Vica Runner Alford. She died on March 6, 1986 and Doctor Franklin died April 17, 1952. Mary Caroline died December 18, 1947, and James William died in April 11, 1934 and both are buried at Ridgway Cemetery. All ROSIERs, Left to Right: GEORGE WASHINGTON, NINA CHURCH, HARRY LESTER, REBECCA ANN CARRICO, ROSA ELLEN "ROSIE", HERBERT "NEIL", WILLIE "ROSS", HENRY ALVA aka "JOHN", and IRA ROSS. Location is the old Rosier farm near Amboy, WV. The first child was Melvin Elmer born February 19, 1886. He married Bessie Irene Smith on December 24, 1916 and lived in Morgantown. She was born on December 20, 1890 in Taylor County, the daughter of J.C. and Rose Saffle Smith. They lived in Morgantown and had no children. Bessie died on August 12, 1980 and is buried at Beverly Hills Memorial Garden in Morgantown along side Melvin. Melvin died on October 13, 1962. Henry Alva "John" (never married) was born at Kasson on September 25, 1887. He was delivered by Sarah McDaniel, a midwife. Henry worked at M&K Railroad Shops for 12 years and operated a gasoline service station at Jerome Park, along with being a Sabraton Volunteer Fireman. He was a member of the Knights of Pythias and JOUHM. Nicknamed "John", he never married and lived in Morgantown until his death at the age of 50 on May 26, 1938. He is buried at the East Oak Grove cemetery in Morgantown, West Virginia. Harry Gordon Rosier (my grandfather...died young so I never knew him) was born on March 19, 1890. He married Nina Hazel Church on June 20, 1915. Harry worked as a machinist and a welder and Nina was a teacher. Nina was born in Taylor County on December 13, 1889, a daughter of William Oliphant (b.1863, d.1950) and Mattie Barnes Church (b.1868, d.1926). Harry moved from Amboy to Morgantown at the age of 11?, and worked for the Jackson- Grow Machine Shop for 9 years. Nina was a graduate of Fairmont State College, attended West Virginia University and taught for many years in Monongalia County schools. She was a member of Pythian Sisters, Delta Kappa Gamma Sorority, the WCTU, the Morgantown Historical Society and Senior Citizens. Harry died young on October 13, 1934 form a heart condition. Nina died on September 10, 1979, and both are buried at the East Oak Grove Cemetery in Morgantown, WV. More details of this family in Appendix 5. LeeRoy was born August 25, 1892 and died June 27, 1941. He married May Applegate on August 11, 1917. May was born in 1896, a daughter of John Applegate and she died in 1975. They had four children: Andrew Lloyd, Harvey Glen, LeeRoy and Pearl "Bunny". An interesting side note is that May supposedly left for California after LeeRoy died in 1941, with Dutch Rosier from Colebank. Arnie Lee "Dutch" Rosier was born in Colebank and was nicknamed Big Dutch and his wife Ella was named Little Dutch. If he and May left for California in 1941, then he was running around on Ella. My father told me "Dutch was a character". Arnie and Elle's granddaughter Melissa Rosier Ireland has Arnie's wallet that he had when he died, and there is a picture of an unknown woman in it. Was that May Rosier? I understand Arnie worked in the shipyards in Baltimore during the War, but he could have gone out west for a time. 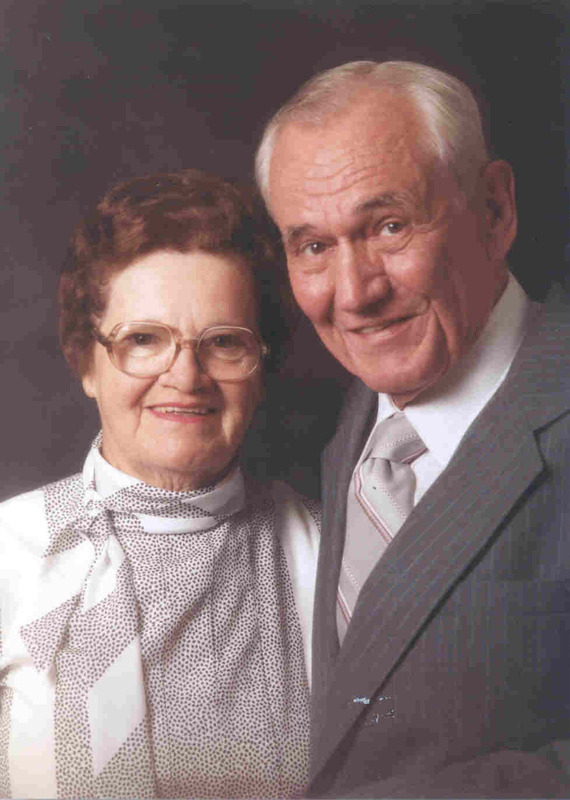 Andrew Lloyd married Mamie Ellen Ramsey on June 30, 1946 and lived in South Gate, CA. Harvey Glen married Delores Wray and lived at Huntington Beach, CA. LeeRoy lived in Baltimore and had a daughter named Mary. And Bunny married Roy Leonard Slofford and lived in Springfield, MO where they had 4 children. Rosa Ellen "Rosie" was born in Union District, Preston County on February 18, 1894. Rosa married Owen Fay Kisner (b.8/5/1898 d. 10/14/1974) on May 27, 1944. They lived in Morgantown. They had no children. She is buried at East Oak Grove Cemetery in Morgantown. Herbert Neil was born at Amboy on June 25, 1897. He married Ruth Everly on June 30, 1923. Ruth was the daughter of J. Cark and Lucinda Cox Everly. Neil, as he was known, was employed by the B&O Railroad at Cumberland, Maryland for 20 years, was a member of JOUAM, and Lodge No. 332 of the International Brotherhood of Boilermakers, Ironship Builders, Blacksmiths and Forgers of America of Cumberland. Neil and Ruth had no children. Ruth died on June 22, 1965 and Neil died on February 22, 1960 and both are buried at the East Oak Grove cemetery in Morgantown, West Virginia. Willie Ross "Ross" was born at Amboy on May 19, 1900. 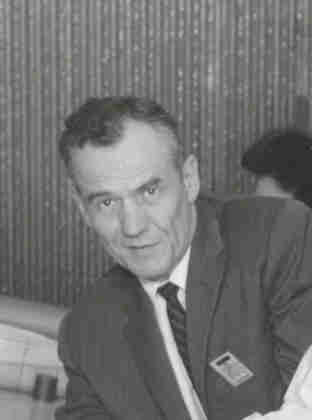 He married Frances Musick on March 31, 1951. They lived in Morgantown where he worked as a miner, last working at Rosedale Coal Company. He was a member of JOUAM and UMW local union. He and Frances had no children, but their niece Vicky Musick stayed with them a lot when she was growing up. Frances and Ross were very good with children. Ross died on December 29, 1983, and Frances died in 1992. Both are buried at the East Oak Grove Cemetery in Morgantown. Ira Ison was born August 17, 1903 and never married. He died young at the age of 28 on June 13, 1932 and is buried at the East Oak Grove cemetery in Morgantown, WV. Harry Gordon Rosier (my grandfather) was born on March 19, 1890. Harry moved from Amboy to Morgantown at the age of 11?, and worked for the Jackson-Grow Machine Shop. He married Nina Hazel Church on June 20, 1915. He worked as a machinist and a welder and Nina was a teacher. Harry died young on October 13, 1934 from a heart condition. Nina (AKA Granny) was born in Taylor County on December 13, 1889, a daughter of William Oliphant (b.1863, d.1950) and Mattie Barnes Church (b.1868, d.1926). 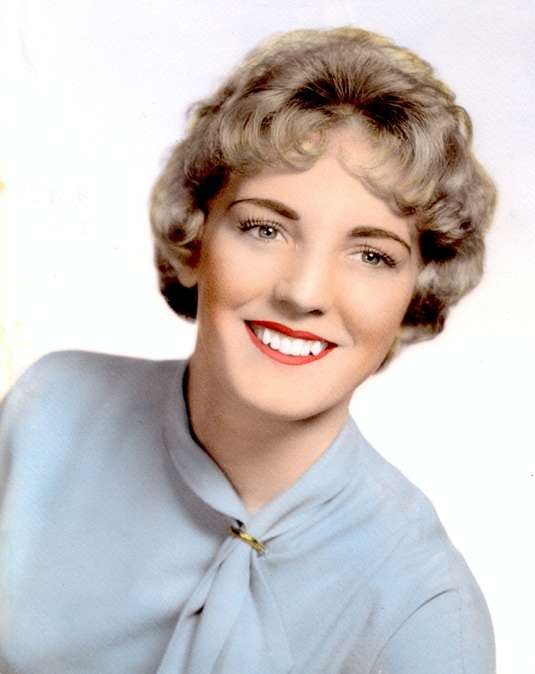 She was a graduate of Fairmont State College (then called Fairmont Normal School), attended West Virginia University and taught for many years in Monogalia County schools. 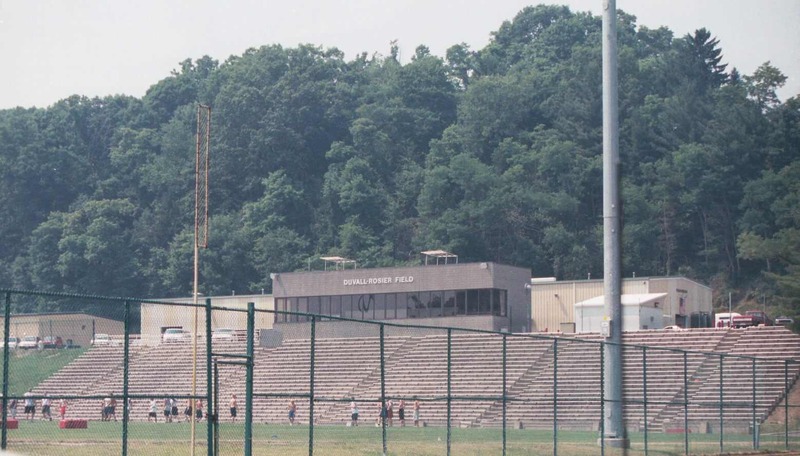 At Fairmont State College, the Athletic field was named "Rosier Field" (see picture) after John Wesley Rosier (b.1842) who was the President for several years. 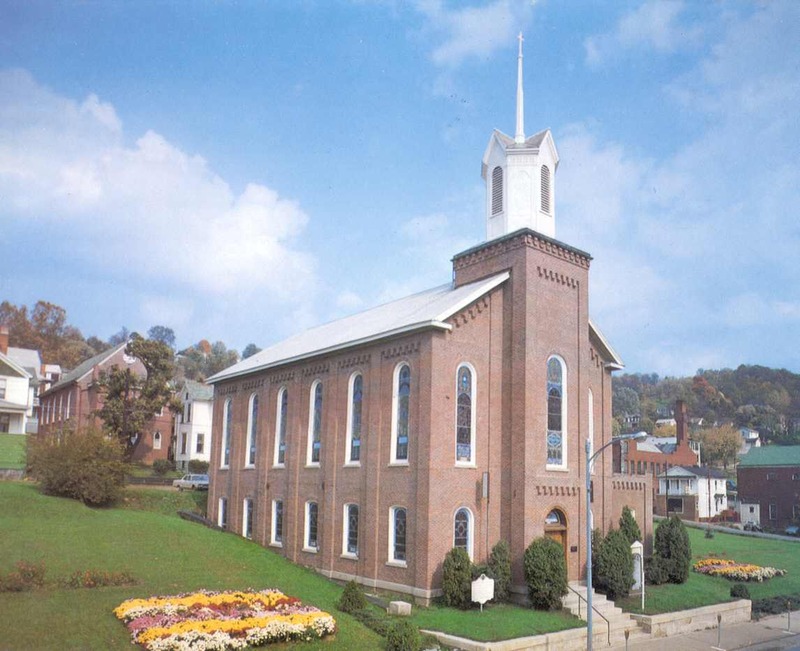 An interesting tidbit is that Nina was at the Andrews Methodist Church in Grafton, West Virginia on May 10, 1908 which became the very first observance of Mother's Day in the US. They were honoring Anna Reeves Jarvis and West Virginia Governor Glasscock declared it to be an observance of Mother's Day. If you would like more detail, see Appendix 7. Nina was a member of Pythian Sisters, Delta Kappa Gamma Sorority, the WCTU, the Morgantown Historical Society and the Senior Citizens. All of the grandchildren and great grandchildren called her "Granny". Nina died on September 10, 1979, and both are buried at the East Oak Grove Cemetery in Morgantown. Harry and Nina had four children, Harry Lester (my father), Nina Margaret, Mattie Rebecca, and George William. Harry Lester Rosier was born on April 28, 1916 and married Elma Edith Dalton on September 7, 1935 at Oakland, MD. Elma was born on March 29, 1915, a daughter of Thornton Dalton and Alice Nicholson. They had Gordon Lester, Robert Edwin, David Ralph, and Douglas Byron. David Ralph (1942-1943) died at an early age from Spinal Bifida. Elma died August 31, 2004 and Harry died February 28, 2005 in Roanoke, VA and both are entombed at the Guilford Memorial Park Mausoleum in Greensboro, NC. Nina Margaret Rosier was born on June 30, 1922 and married Joseph Ted Ashworth on June 20, 1945. Joseph was born on August 8, 1926. He and Margaret lived at Surfside, SC and adopted Margaret Ann (b.4/27/1954), and married a Douthitt and lived in Bedford, IN) and Matthew Alan (b. 2/18/1961). Mattie Rebecca was born on October 1, 1923 and married Carmen DiCarlo on September 7, 1947 at the Presbyterian Church in Morris Plains, NJ. Carmen "Carlo" was born on February 24, 1924 in Morgantown, WV, a son of Nicolo and Sylvia Feo DiCarlo. Carmen and Mattie lived in Alexandria, VA, but moved to Bel Air, MD. They adopted Rebecca Ann (born 3/9/1958) who married John Robert "Bob" Stewart on June 23, 1984 and lived in Delta, PA and adopted David Nicholas (b. 7/11/1961) and married Susan Kathleen Sufczynski (b. 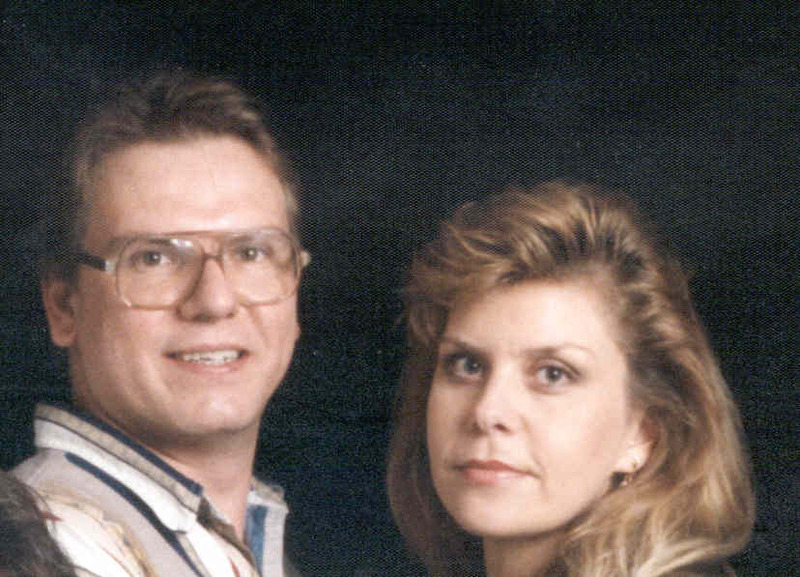 1/9/1964) married October 19, 1991 and live in Bel Air, MD). George William was born on December 9, 1926 and died as an infant on April 21, 1927, and is buried at East Oak Grove Cemetery in Morgantown, WV. Only 5 miles from the old Rosier farm was the West Virginia-Maryland State Line. For many years, this boundary was disputed. In 1910, the dispute was finally settled in the U.S. Supreme Court. A surveying team was commissioned to find the true line between the states. The surveyors' notes read "Continuing on the same course, a large anciently marked white oak tree was reached and identified as the beginning of a Virginia tract of land surveyed for John Pettyjohn on May 30, 1781 for 400 acres. The call being at 'a white oak in the Maryland line and running-and finally to pointers in the Maryland line and said line N. 226 poles to the beginning.' This tree was cut and blocks taken out by your commissioners which showed surveyors' ax marks in the wood; one 130 years old, one 117 years, and the last 78 years, thus indisputably establishing this course as following the oldest marked line extant." The stump of this tree was blown up with dynamite and replaced by the State Boundary Monument No. 8 in the exact spot occupied by the original white oak tree. On May 10, 1908, the first Mother's Day observance was held in Andrews Methodist Church in the small town of Grafton, West Virginia. Nina Hazel Church Rosier (my grandmother) was visiting her grandparents, Mr. and Mrs. W. H. Barnes and went with them that day to that very church. Nina's father, W. H. Barnes helped built the church. Mrs Rosier remembers Mrs. Anna Reeves Jarvis, who was honored that day, as a "demure little old lady, devoted to her church and teacher of a primary Sunday school class". Her daughter, Anna, was a girl friend of Nina's mother, Mattie Burns Church. Miss Anna ordered enough white carnations so that each person in the congregation would receive one. My grandmother has cherished her carnation through the years, even though today it is dried petals in her Bible. It was Miss Jarvis' idea that once a year, with the arrival of the first spring blossoms, the people of the community pause for a day to honor their blessed mothers, living and deceased. That the idea was a good one and had great appeal is confirmed by the fact that on May 8, 1914, President Woodrow Wilson signed a proclamation designating the second Sunday in May to be annually observed in this nation as Mother's Day. From that time the observance of the second Sunday in May as Mother's Day spread from its small beginning at Andrew Church to all parts of the nation and world.